Orrent Geontene is a Breton nightblade and an Apprentice of the Guild of Mages. Geontene is found in the entrance hall of the Ald'ruhn Mages Guild. He wears a common robe and amulet, wields a leveled shortsword (up to Dwarven quality), and carries 40 drakes. 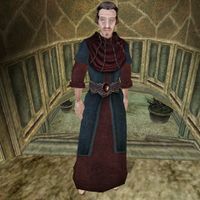 If you ask him for the latest rumors he'll say: "Edwinna often complains about how the Archmage [sic] of Vvardenfell, Trebonius, doesn't really care about scholarship."